Are you measuring them the same way as the string maker? I don’t know for sure how far they will stretch, but I would put them on the bow and leave it strung for a day or so and then measure. If they are Flemish, they can sometimes be untwisted a little. They may measure an inch short when not on the bow, but not when under stress. Put one on the bow and leave for a fortnight and see what happens, if it is an endless, probably too short. I would try one. Let it stay strung for a day or two. Depending on how made and maker 1 inch for B-50 is good. We used to figure two inch stretch was normal. When ordering B-50 for any of my recurve bows, I use the old standard of 4" shorter than the amo measure of the bow. Mostly they will stretch to the proper length...even ones that have been pre stretched. That's my experience with Dacron. I don't use it much but keep Dacron strings for tuning to different arrow sizes now and then. I can't answer why you would order a certain string length though and not get what you ordered. When you order string length, and not AMO length, you should get what you ordered. Yep ,i do not use it any more because of it,s stretch.You should be fine once you put it on the bow, and shoot it for a while.In the end you may have to put some twist back in the string to maintain proper brace height. what 2 bears said. and put it on your bow and shoot it a day or 2, you will probably have to twist it up some imo. When I string a recurve with B-50 I lay the back of the limbs across my thighs, just above the knees,with feet at shoulder width. I then press steadily down on on the end of the limbs with my palms. You'll feel the string stretch a bit and the brace height will drop. It occurs with any string on a bow that has not been strung for a bit, even ones that were tuned and shot a lot. B50 still makes a good string. Just twist it up a few turns and brace the bow. Take 3 or 4 shots up close and let it sit on the bow for a couple days. Then set brace height and shoot it a bit. You may or may not need to adjust brace height again as it settles in. It's like wood arrows, you just need to learn to work with them. If it has been properly pre stretched, it will never stretch an inch in the off the bow length. I want someone to take their bow strung at the desired brace height. Take it off the bow and let it relax for a minute(only if dacron). Put one end on a nail, pull hand tight and measure end to end. That is the length I will make a pre stretched string too. Measured strung on the bow and shot in would be the best measurement - but few do this accurately. How about if you ask the person who you ordered the strings from. dr....there is either a disconnect between you and the string maker, or you need another string maker. B-50 doesn't stretch that much, regardless of whether a Flemish or endless string. Not if it's made correctly. It's not stretching, it's slipping in the splices. Not the same thing. at all. While some say it will stretch that much, I would agree with fdp. Here's an example of how strings can be too short or too long when telling a string maker only your bow length and not your bow model or past string measurement. Had a string maker (Bearbowman in WV) once make me two strings. One for a 1959 64-inch K Special and one for my 1960 K Special. 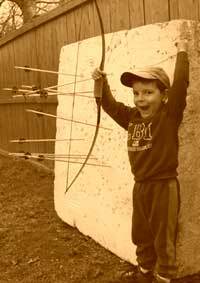 He told me the 1960 would take a shorter string, even though the bows were both 64-inches, based on his past experience with those two models. He was right-on. The 1960 bow had to have a string 1-inch shorter. Can't always go by the bow length alone as these two bows, which look very much alike, use different length strings, but he knew the difference enough to make the proper length adjustment. Thought he was pretty cool after that and still makes the best looking four color B-50 strings around. A good string maker with experience can be the key. Also, if you do get your B-50 1-inch too short string to stretch, might want to check the brace height for any change 30 minutes after you string your bow. I have found that my brace heights can lengthen by 1/4 to 3/8 inch after stringing, so if I'm shooting a 3-D, I will check that after I shoot some warm-up targets. This is especially the situation if using a new bow string which may have been a little short, but some twisting adjustments will make things right again. Regardless of strand count - A polyester/dacron string will have an unrecoverable stretch of a tiny bit more than 3/4" than will a FF low stretch blended material, and will have an unrecoverable stretch of a tiny bit less than 1/2" than will %100 HMPE FF low stretch materials. Of course, that is after the finished stretching, and conditioning during the build. The above will increase or decrease with longer, or shorter strings, and I have formulas to calculate the stretch as it relates to the length of string for each material. They will all contract some when relaxed, but go right back to where they were when loaded/braced onto the bow, and the polyester materials will contract quite a bit more than the FF low stretch materials. I think that's where the misinterpreted 4" difference come from, but even that will change with changes in string length. I use it for many things! Over kill some have said BUT who cares it works for me and I tie my silencers on and wrap wool yarn down the "Y" section of the string loops if I need to.Made it in 2014 and absolutely love it. Keep it parked on top of bench out of my way when not in use. You will probably get an inch out of them, at least close. I don't order B-50 anymore. If I need Dacron, I'll use B-55. You might get to proper brace height eventually with that string.You will have to see what happens.If its not prestretched you will have a better chance. I would shoot it with as little twists as possible assuming its Flemish twist.Dont go to far though on the untwisting. When its shot in for a few days and its possibly still too high you may want to wax the string well and take a 2x2 inch piece of leather and rub it up and down the string vigorously while its on the bow strung up.Going from the serving to as far up the string as you can go.Build some heat up as you go up and down fast.But don't burn the string or singe it.This will typically stretch the string a bit more when your close to where you want it.But want a little bit more length. If all fails return string and another. heftyhunter, call the string maker and ask him if he prestretched the string. I would do as Dean said. Untwist it a bit to bring it correct length and tighten it up as needed.